Step 1: When you step into the room you see the 6 symbols in the middle, each of these symbols corresponds to a plate around the edge of the room. The fireteam will be split into 3 groups of 2. Each group will be responsible for one set of symbols. Each member of the fireteam will go to stand on a plate with a symbol from the middle. You will kill adds until a knight spawns. Each plate is split into 3 sections. At random, two sections of the plate will become corrupted with a large orb on them. You need to avoid these two sections of the plate by standing on the 3rd section that is not “active”. After everyone kills their knight, migrates to the middle for DPS. Step 2: In the middle for DPS, group in the bottom of the pit, from there everyone should be using Sleeper or Whisper and while targeting her head. Near the end of each DPS phase, doors lining the bottom walls of the pit will open. 6 doors will open, 1 for each member of the raid team. Every member of the team will be assigned a door to enter during this phase. When the raid leaders call “doors” you will head to your assigned door. The doors open in random order and we number them starting with the upper leftmost door being 1 and going from top to bottom, left to right, with the bottom right most door being 6. If you do not enter your door within the time given, you will die. Once you enter it the door will close and you wait for it to open. Step 3: When the doors open, you'll be greeted by a mob of adds in the middle, kill them, and continue shooting her in the face. If damage is good, we should only have to do this once - if not, this process starting with step 1 is repeated with the exception that the symbols have changed. Step 1: This is an endurance fight and timed DPS race. Kill the adds and begin moving. You will see Shuro Chi ahead of the group on a platform. Supers can be chained and hunters should be using tether. Waves of adds will constantly spawn. As the group approaches the platform she is on, there will be two waves of adds that spawn. After the second wave - you will see 3 crystals spawn - 1 on each of the 3 plates that are surrounding Shuro Chi. The raid leaders will have assigned 3 members of the team to jump onto these plates and grab their respective crystal. Once done, each person on a plate will turn to their right, aim at the fireteam member on the plate to the right of them and fire the crystal directly at them. This will create a “link” around Shuro Chi will once held steady for a few seconds (forms a triangle around her) will destroy her shield and she will be able to be damaged. Step 2: DPS. Each section of her health represents each time you're going to have to do step 2 and 3 (it will be repeated 6 times - twice per floor). Everyone will use Ikelos SG, Thunderlord, Whisper or Sleeper. Shoot her in the head to bring down her segment of health. Once her segment of health has been depleted, no more DPS can be done to her. Warlocks will put down a well, Titans will put down a rally barricade in the same spot. Fireteam will group up to get those buffs and DPS her. Step 3: After her health segment has been depleted, the group will move to the next platform where she will have warped to, kill adds and repeat steps 1 and 2 above. Step 4: Puzzle room. When you enter this room you'll see 9 plates in a grid, and 3 circles on the wall. Starting with the one on your left, the circles are “cut” into a grid of 9 sections - 3 rows of 3 “squares” with each square corresponding with a plate in the middle of the room. 4 random “squares” on the circle will be exposed. This lets the raid team know which plates need to be stepped on. The raid leader will assign a call out order for those members that are stepping on plates. The 9 squares are each assigned a number that is representative of a keypad using the numbers 1-9: the top row being 1-3, middle being 4-6 and bottom being 7-9 (left to right). The plate team will make a call out in order, of which plate they are stepping on (that is closest to them) that correlates to the square on the circle. All 4 plates will need to have a member stand on it. The member that goes last will call out 1-2-3 - up/jump and everyone will know to jump onto their respective plate. If done correctly, the squares on the circle will “fill” completing the circle, the circle will flash and the group will pivot to the next circle to the right of the one that was just completed. The orientation of the plates on the ground changes to remain consistent with the direction you are facing towards the respective circle. This step is repeated 3 times during the puzzle and once completed platforms will drop from the ceiling. That you will jump up on to get to the next floor. Once the next floor has been reached, go back to step 1 and repeat. There are 3 floors and you DPS Shuro Chi twice per floor. Step 1: The raid team will be split into two groups a 3. A group for the left and right of Morgeth. A member will collect the first taken strength by Morgeth. This starts the encounter. Step 2: Kill adds and collect Taken Strengths as they appear. Each person can only hold two. The team on the left will each only grab 1 Taken Strength while the group on the right will each work to grab 2. Step 3: Kill the Eyes of Riven, when someone is tethered by Morgeth, you use the orb dropped by the Eye to cleanse the person who is “frozen” by hitting the grenade button right by the person. Step 4: Once the group has reached enough Taken Strength a final Strength orb will appear where the first taken strength spawned by Morgeth. A member of the team with that only has 1 strength will grab this final orb and this starts the DPS phase. His crit spot is pretty much his entire back and head – it is massive. The team should all have Whisper equipped and we group up at the entrance area. Warlocks put well down, Titans drops rally barricade and if you hit all of your crit shots, he should be one phased. If not, go back to step 1 and repeat. Step 1: The Vault is split into 3 sections. There is a section with a large rock which we name “rock”, one with a large tree and green area labeled “tree/forest” and a final area which is the area that you entered the vault with a stair case called “stairs”. Each section has a plate in the middle of the room. 3 members of the team will stand on the three plates around the center, when you do this 3 symbols will show up. Step 2: Starting with stairs – the person on the stairs plate will call out the symbol that is in the middle of the three they are looking at. The members on the tree and rock plates will check to see if they have the same symbol and they will say “I have that it’s on my right/left” followed by calling out what symbol they have in the middle – which the final plate person will confirm “I have that it’s on my left/right”. If the symbol is on the left, then your plates debuff is "Pentumbra" if it's on the right, it's "Antumbra". 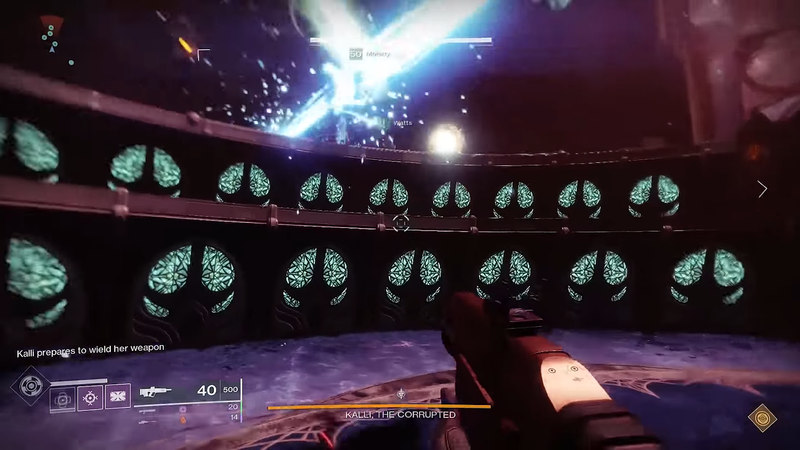 Step 3: 2 of the room sections will be blocked off, in the room that's not, an Eye of Riven will spawn, kill him, the raid will have designated a runner that will pick up his orb and then they will run either left or right to room that opens up. This eye will give the runner either an Antumbra or Pentumbra debuff, and the runner will need to go to the corresponding plate, stand on it and hit the grenade button. Repeat this for each room. Step 4: As this is being completed, a single knight will spawn in one of the rooms at random after the first eye of Riven has been picked up. When the second eye of Riven has been picked up, 2 knights will spawn at random and lastly when the third eye has been picked up, each room / section will have a knight that spawns. These knights need to die asap, if they reach the plate that they are walking towards and put their sword in it, they'll start a wipe counter. It will make a loud sound and the team has 5 seconds to kill that knight or it will be a wipe. Step 5: After 3 people have ran/cleared their orb on top of a plate, you're back to Step 1. This all happens 3 times in total. Step 1: Split into teams of three, on either side of the room is 3 plates, one person needs to be on each plate. For simplicity sake, you have "Tree Side / yellow room” and "Crystal Side / blue room". Step 2: Each team enters their respective room and proceeds to kill adds. In one of the rooms Riven will spawn, she'll either do a tentacle attack (You have to bait the tentacles by running up to them and then running away or jumping – if you are not far enough away or in the air when the tentacle slams down, you will get a nasty push back that could kill you) or breath fire, once she's stunned out of this by doing DPS to either the tentacles or her mouth, her eyes will light up. You need to tell the team on the other side which eyes were lit up (reference diagram). Step 3: While in the rooms, an eye of riven will spawn, kill the eye and have one person pick up the orb. They'll see symbols in the middle stacked vertically, they call out the symbol. Another person gets on the platform that's in the middle/back area that overlooks the steps. They'll be able to see the symbols spread out at various locations. They need to direct the person holding the orb to the corresponding symbol, where that person then hits their grenade button. Step 4: Once Riven comes from the opposing room, there'll be a short DPS period, (if using Whisper you should be able to get 9 shots or 3-4 Sleeper shots), a person on each side (usually one of the raid leaders) will then shoot the eyes that were called out while she was in the opposite room. (For eye call outs, we use L1-L5/R1-R5). Step 5: Once this is done, go through the tunnel at the back of the room and take the elevator up. You'll repeat Steps 2-4 on the floor. Step 6: Take the elevator in the middle up, at this point, all 6 people will be back at the start, clear adds and wait for Riven to spawn. Step 7: Once Riven spawns, she'll either do tentacle attack (remember to jump) or fire breathing attack, stun her out of this with damage, and take note of which eyes light up. This will happen 3 times. The raid leaders will have assigned the team into groups of 2 for this phase. Each group will have one set of eyes they are responsible for. When Riven appears for the 4th and final time during this phase (the DPS phase) and it is time to stun her by shooting her eyes – it is the responsibility of the group to make sure that both of their eyes are shot. Step 8: After the third stun, you enter another mini-dps phase. Like you did in the room below, shoot her in her mouth until it shuts (~9 whisper shots), and then shoot the corresponding eyes. See previous step for how to shoot her eyes. Step 9: Once she is stunned, she will go away and you will need to go back to the plate you were on to start the fight. Once everyone is on their plate everyone will fall back down except this time is a damage phase. As you fall you will see that Riven has bright blue pimples on her. These need to be popped by shooting them as you fall. After one is popped, it will spawn orbs that will try to track you – if they hit you, you will take a lot of damage so be careful. Step 10: If she has not been one phased by time you reach the bottom, repeat steps 2-9 as needed until you hit the last stand DPS phase. Step 11: When she has been pushed the group will enter an ascendant jump puzzle, navigate your way up the platforms to the taken strength at the top, picking this up will teleport your team back to Riven. Step 12: When back at Riven, she will open her mouth, DPS her the rest of the way until her health is completely gone and she will open up her mouth a final time but this time it is different. Step 13: Once her mouth open for the last time, everyone runs inside and shoots the taken heart that's inside her stomach. Once this is destroyed, congratulations, you've killed Riven! A person at random will be selected to pick up the heart first. When that person picks up the heart a timer will begin. On the first run, that person needs to make their out of Riven and stop on her mouth. When the countdown timer hits 10, the person with the heart will verbally make a countdown from 10 to 1. The first person with the heart will be teleported inside the heart when the countdown has ended. When this happens a person outside of the heart will be selected at random to grab the heart – they are the only person who can grab it. The person carrying the heart provides a very large safe area for the rest of the group to stand in. As the timer winds down, this area gets smaller and smaller. The people not standing in this area will get a stack of creeping darkness. If this stacks up to 10, you will die. To instantly cleanse your stacks, you need to step within the AOE that is provided by the heart runner. The person that is teleported into the heart first will have the responsibility of picking up a taken strength to refresh the timer of the heart runner. When the heart runner reaches 3 on the count down, pick up the taken strength to refresh the timer and thus extend the distance they can run it. As more people enter the heart, more taken strength will spawn. Each person that enters the heart will pick up a strength as soon as they enter it – leaving one strength for the initial heart runner to pick up once the countdown reaches 3. When the runners reach the vault area should be (2-3) runners at this point (3 if the group is doing good) – you will need to scan the outside of the vault to see which section is open – either rocks / tree – once in that section, the runners will need to make their way (the long way) through the tunnels that connect the sections until they end up in the stairs section. Once you have reached the stairs section, make your way to the center of the room and fall down the hole. This will take you down the elevator that you used to get to vault in the first place. Once you reach the bottom of the elevator make your way to where the stairs that are lit up – climb those stairs and when you reach a point (finish line) your character will automatically slam the heart into a “well” and you will hear the Techeuns begin to talk. Congratulations you have completed the Last Wish raid.